This hand-carved kitty sits by your side, eliminating those frantic, blurry-eyed searches for your specs. Your feline hunter likes to bring you "gifts" (fellow cat lovers, you know what we mean). This one brings you something you actually want: your glasses. 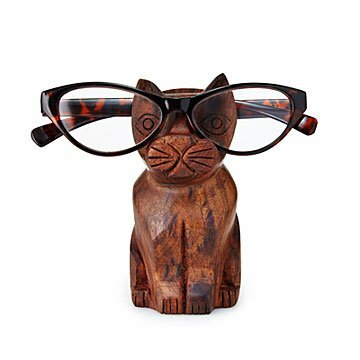 Using a single piece of sheesham wood, Fair Trade artisans in India hand carve the richly finished cat, making a charming piece of decor that also solves the problem of mislaid specs. Keep Ms. Four-Eyes as your own, or send her to a friend to help eliminate the daily, blurry-eyed search for frames. Handmade in India. Product is nice and heavy. Good quality wood. Perfect gift for the eyeglass wearing animal person! This was the perfect gift for my husband who tends to misplace his glassss! He now keeps the cat eyeglass holder on his desk at work and is shopping for one to keep at home! It makes a great place to leave your glasses and remember where you put them. Though he keeps readers scattered throughout the house, my husband always carries them elsewhere and then they aren't handy when needed. A holder like this cute critter is a whimsical reminder to leave the glasses there! My daughter is notoriously difficult to shop for. She gets most whatever she wants from her dad and her interests include Marvell characters and everything cats. Recently she began wearing her contacts more often but she lays her glasses down when she is running around getting ready and i often pick them up thinking they are my glasses. This could have been a wooden cat with no purpose and she would be thrilled but a useful cat is even better. She loves it and actually uses it instead of tossing her glasses anywhere. The perfect gift for a cat lover. This was a Christmas gift for an Uncle who pretty much has everything. It is an unusual and practical gift. However I ordered the Owl Eyeglass holder too and the Cat is much smaller than the Owl (and strangely enough more expensive). One comment on both eyeglass holders is that the packaging leaves very little to be desired (hence docking a star). The cat was wrapped in wrinkled, oil stained (?) brown paper and packed in a very simple brown, non descriptive box (with a few dents in it) with nothing but a bar code and generic label saying " cat eyeglass holder". I actually went online to the Uncommon goods website and printed a picture of the eyeglass holder myself to actually show how to use the gift and tried to "jazz" up the box a bit as I was embarrassed to give it as gift it arrived from Uncommon goods. Keep glasses close at hand and always know where they are located.